Coleen started working as an on-the-job trained technician in a multi-doctor veterinary hospital in 1992, where she quickly developed a passion for dentistry and radiology. In 1996 Coleen helped open a new veterinary hospital with many new responsibilities. Coleen has been to one World veterinary Conference, multiple Canadian and Atlantic Veterinary Conferences to enrich her knowledge, particularly in dentistry. Outside of work, her interests include travel, competitive curling, horses, soccer, camping and looking after any strays that may follow her home. 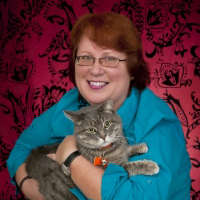 Coleen enjoys working with people and their pets on a personal level. Coleen lives in Cole Harbour with her handsome man “Romeo” who she rescued as a stray and nursed back to health with partner, Colleen. Coleen has recently opened her heart and her home to “Rudy”, a young rescue who is much appreciative of his newly acquired family.